Item shown above : Oak Finish with a RED color felt background. (Medals not included). 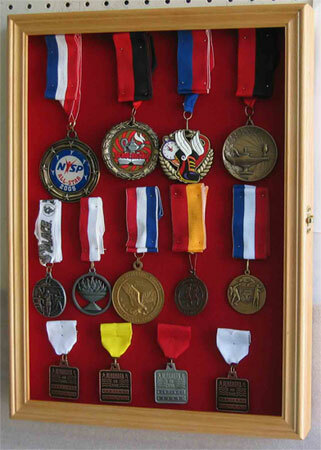 This solid wood Medal display case would be a great way to display your collection of medals, Ribbons, and Insignia. RED color matted background to create a lovely display. Simply pin the medals onto the backing as seen on the pictures. Hinged glass door to protect from dust and damage. Brass hinges, door latches, and wall brackets to hang (wall mounted). Comes in one piece, not assembly required.